As exciting as it is to go on a vacation for spring break, and as much as we all deserve to let loose, we must maintain a certain level of decorum, no matter what the situation. Here are some guidelines so that you can enjoy your time off with no regrets when you look back at the photographic evidence of your fun. Go ahead and be revealing, but not too revealing. When you’re in a tropical location, dancing to great music with a drink in your hand, you may be tempted to be more revealing then you would in normal circumstances. Fight the temptation and keep your clothing on. If you’re about to do something you would judge someone else for, then you probably shouldn’t do it. Be sparing with photographs. You should really expect any picture you take to end up on social media, so with that in mind don’t snap a photo you wouldn’t want to be on the front page of The Times. Be wary of trusting people you just met. Spring break is a great opportunity to meet people from schools other than your own, however don’t believe everything you are told. Sure that smokin’ guy may be an engineering major at Harvard with his own company and an apartment in Manhattan, but exercise some caution to avoid getting fooled. Maintain all etiquette standards. 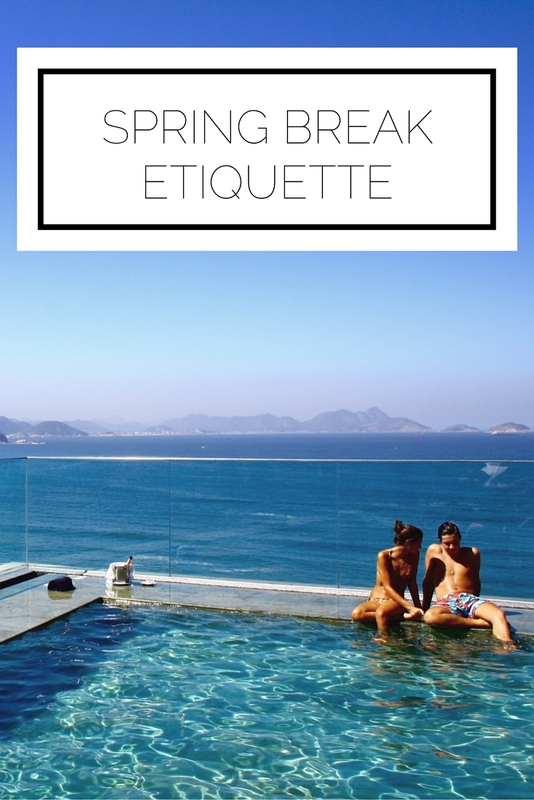 Spring break is not an excuse to forget your manners, so remember that it all still applies! When you eat, even if it’s poolside, you must put a napkin on your lap and remember to tip those who serve you. You polite collegiates won’t have any trouble having a successful spring break if you keep these tips in mind! Have fun, be safe, and make good choices! This article was originally published (by me) on HerCampus TCNJ! "If you're about to do something you would judge someone else for, then you probably shouldn't do it." great advice for really anything. Love these!